Unique complex that replaces trace and minorelements used by fishes, corals, and other invertebrates, and which are lost through chemical filtration (protein skimming and use of filtration media such as resins and activated carbon). Provides 29 minor and trace minerals, all present in natural seawater ratios. Does not contain minor or trace elements not expressly known to be utilized by marine organisms or take place in chemical interactions. Rēplenish provides only those minor and trace elements found by oceanographers to exhibit non-conservative behavior in seawater (meaning that they are depleted by biological and chemical reactions taking place within the photic zone) and that are safe for human handling. Elements are present in natural seawater ratios (i.e. the ratios in which they are present in seawater). Since they are not depleted by biological nor chemical interactions, no minor or trace elements that are not expressly needed by aquatic organisms are present in this product; this includes unnecessary elements such as lithium, rubidium, and molybdenum. Of the detectable elements in seawater, 11 are minor elements and 52 are trace elements. Between the two groups, at least 13 elements appear to be expressly-required for the growth of primary producers such as algae, and an additional 18 are either incorporated into living tissue/skeletal material or undergo chemical interactions that cause their depletion in surface waters. These elements are important to a number of enzymatic and vitamin-synthesis reactions for plants and animals alike; additionally, they influence pigmentation, and therefore coloration, of various organisms. Iron is utilized in the production of chloroplasts; it is very important to photosynthetic organisms such as phytoplankton, micro- and macroalgae, coralline algae, and zooxanthellae. Although iodine is a minor element, it is taken up by algae and aquatic plants more rapidly than other minor elements, and is not included in this product, but rather in separate supplements. Advanced: With the exceptions of iodine and iron, there are no hobbyist-grade test kits that provide reliable measurements of the concentrations of many minor and trace elements present in marine aquaria. It’s therefore not possible to chemically determine exactly how much of a trace and minor element supplement to dose; rather, you must rely on the appearance of the livestock to make that determination. We encourage new users of this product to dose 1 ml per 10 US-gallons weekly for the first four weeks of use; this corresponds to dosing 0.14 ml (~3 drops) per 10 US-gallons each day. Then, gradually increase the weekly dosage to 2 ml per 10 US-gallons over the following four weeks and maintain this dosage. Starting at a low dosage will not cause any harm to the livestock, and will enable you to notice subtle changes in the appearance of the system that indicate the effectiveness and need for the product. Daily dosing maintains more stable concentrations (and a more natural environment) than dosing weekly, in which the concentration of elements spikes just after dosing and then gradually decreases throughout the course of the week. 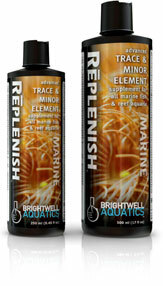 Though trace elements are essential in reef and fish-only aquaria, the gross overdosing of a trace element supplement can be harmful to aquarium inhabitants. Minor and trace elements are made unavailable in marine aquaria largely by adsorption to particulate organic matter (POM); therefore, it is recommended that protein skimming and other means of POM removal from the aquarium be in operation at all times.